Microsoft and Google are unlikely partners nowadays. After all, they are direct competitors on many fronts. There is Bing vs. Google Search, Windows vs. Chrome OS and Office vs Google Docs. Let us not forget that Google has been blocking Microsoft's YouTube app on Windows Phone. Heck, Google has essentially ruined Windows Phone for many, by not bringing its services to the platform. Surprisingly, despite all the bad blood, Google has embraced Microsoft's Xbox One game console. Today, both companies announce that you can now upload Xbox One gameplay footage directly to YouTube or watch a YouTube video while simultaneously playing a game. "Next time you’re playing Titanfall and nail that jump-run-jetpack move, there's a new way to show it off to your friends. 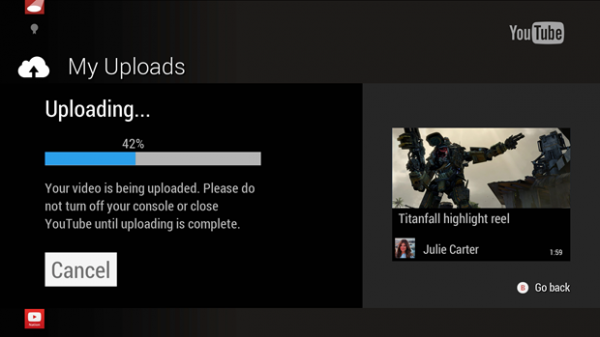 With the new updated YouTube app for Xbox One, you can now upload gameplay from your Game DVR to your YouTube channel in just two clicks", says Sarah Ali, Product Manager, Google. Ali further explains, "YouTube now also supports Xbox One Snap Mode (so you can move it to one side of your screen, where it will continue to run while you do something else on the main part of your screen) 'cause ain't nobody got time to switch between screens while in the middle of a game. Watch a how-to video while stuck on a board, play an awesome music playlist while you finish a level, or catch up with the guys from TeamCrafted while browsing on your Xbox One". While these improvements alone are awesome, that is not all. Apparently, you can also earn ten achievements by interacting with YouTube through your Xbox One in various ways. One of the achievements is earned after you watch 5 hours of gameplay footage. Watching 5 hours of someone else playing a game sounds incredibly dull, but if achievements are your thing, get watching!